Author George R.R. Martin is known for writing complex characters who are neither all good nor all bad, and who develop as the story progresses. Did any of your opinions on the characters change through the course of this book? In A Clash of Kings, Catelyn's chapters end with a cliffhanger on the fate of Jaime Lannister. We don't see until this book what she decided to do. Did you think that she would free him? Did she make the best choice? 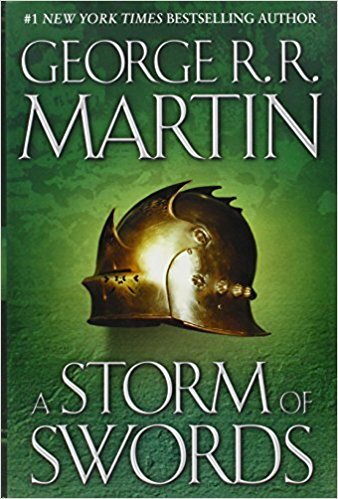 Jaime Lannister becomes a point-of- view character in this book for the first time. Does that change the way you think about him? Why do you think GRRM chose to introduce his POV now, and not earlier? Sansa is often criticized for being passive or shallow; other readers defend her, saying she's just doing what she must to survive. Do you see her as a strong character or a weak one? Why? In this book, we have two pairs of characters who are traveling together, one of them ostensibly the prisoner of the other. Jaime & Brienne start out with an adversarial relationship. So do Arya & the Hound. But in both cases their goals are actually the same. Compare the two relationships. How do they change through the course of the book? How do the captives and captors begin to feel sympathy for each other? Do you think Jon ever seriously considers joining the wildlings for real? GRRM's worldbuilding is detailed enough to include lyrics to quite a few songs. A song in this book that showcases an ongoing motif is "The Bear & The Maiden Fair." How many pairs of "bear" and "maiden" do we see? Brienne's in a pit with an actual bear. Arya and the Hound? Sam and Gilly? What about Dany, who has trusted Jorah Mormont, whose house sigil is a bear and who is described as being big and broad, with lots of dark hair on his body? One of GRRM's first television jobs was writing for the series Beauty & the Beast. Do you think he's playing with some of the same themes here? Speaking of songs, when Symon Silvertongue writes a song that exposes Tyrion's relationship with Shae and tries to blackmail him with it, Tyrion has him killed. How is this different from an earlier episode when Joffrey maimed a bard who sang a satirical song about the Lannisters? Why are we willing to give Tyrion a pass, while we condemn Joffrey's act? Why do you think Stannis is wrapped up in Melisandre and her Red God? He doesn't seem the type to get lured in. What do you think of Mance Rayder? Is he a hero or a villain (or a little of both)? What is his biggest crime, in the eyes of his former black brothers: leading the wildlings against Westeros, or forsaking his Night's Watch vows in the first place? The White Walkers make a much bigger appearance in this book. What do you think of them? And we see in this book that turning into a blue-eyed killing machine is not the only form of rebirth in GRRM's world. Consider Beric, Catelyn/Stoneheart, and Coldhands. We know Bran is a warg, and now Jon seems to be one too. In this book, we see that Arya has similar potential, despite having lost her wolf in Book 1. Rob, on the other hand, becomes a cruel parody, when the Freys sew Grey Wind's head onto Rob's body after the Red Wedding. Do you see any evidence that Rob and Sansa would have discovered the ability to see through their wolves' eyes, if they'd been given the time? How has the relationship between the Starks and their wolves changed since Book 1? Again with the maimed hands. In this book, Davos's missing fingers go missing for good. Jaime struggles to come to terms with his new life without his right hand. Tyrion struggles to come to terms with his own new life as no-longer-the-Hand, and even strangles Shae with a chain made of little interlocking hands. Even Baelish's nickname is Little Finger. And then there's Qhorin Halfhand.... Does GRRM have a hand fetish? What is he trying to say here? The theme of hospitality runs strongly throughout this book; in this society, breaking the trust between host and guest is a more serious crime than murder. Discuss the story Bran tells of the Rat King. Compare it to the wedding at the Twins. The murder of the two Lannister boys at Riverrun. The slaughter at Craster's Keep. In fact, keeping one's word is at the center of the values most of these characters hold dear, but most of them break their word repeatedly. How does this play out with Jaime and the promise to protect Catelyns' daughters? Baelish's rewarding of Ser Dantos's efforts with a bolt through the heart, in lieue of the agreed-upon payment? Daenerys's shock and outrage when she learns that Jorah betrayed her trust? (Why does she let Barristan Selmy off with a lighter punishment, when she learns that he hid the fact he was working for her enemies?) But why do we cheer for her when she reneges on the deal to trade a dragon for an Unsullied Army? Did you really think she would give up one of her "children"? Among high-born families in the "Song of Ice & Fire," marriage is often a political tool. Give examples of some good marriages and some bad ones, and talk about what makes them work (or not)? Speaking of marriages, there are three weddings in this book. Even in the most joyous of the three, there's no joy: the bride and groom are being forced into it. But at least nobody dies. Did you see the Red Wedding coming? Why do you think GRRM chose to kill off main characters this way? What about Joffrey's death at his own wedding reception? Did you enjoy this book more or less than the earlier two books in the series?